President Yoweri Museveni arrives in Davos, Switzerland. Kampala — President Museveni yesterday evening arrived in Switzerland for a three day working visit attend to the 49th summit of the World Economic Forum (WEF). The annual summit in the Alpine Ski Town of Davos brings together political leaders, lobbyists, chief executives, academics and activists. The theme of this year's gathering is Globalisation 4.0: Shaping a Global Architecture in the Age of the Fourth Industrial Revolution--how to make globalisation work for every world citizen, not just a few individuals. 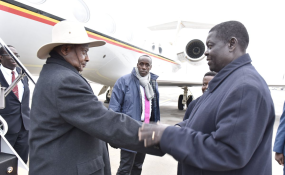 The President was received in Switzerland at Kloten Airport by Ambassador Christopher Onyanga Aparr, the head of Uganda's Mission. Some 50 heads of state and government from around the world are expected to attend this year's summit to discuss challenges facing the global economy and the way forward. Some of the leaders attending include Japanese Prime Minister Shinzo Abe, German chancellor Angela Merkel, New Zealand's Prime Minister Jacinda Ardern, Brazil's new president Jair Bolsonaro, among others. UK's Guardian newspaper yesterday, quoting experts, predicted up to 1,500 individual private jets to fly to and from airfields serving Davos for the summit which ends on Friday. According to the WEF website, up to 3,000 dignitaries are expected to attend the summit tackling world problems in over 350 sessions. "After World War II, the international community came together to build a shared future. Now, it must do so again," the WEF founder and executive chairman, Prof Klaus Schwab, is quoted on the website.